Imagine getting career advice from Muhammad Ali; a lesson in stardom from Bill Clinton; watching Don Rickles embarrass one of your most important customers; being caught red-handed using the product of your client’s biggest competitor; lying to the president of the United States; firing your wife from your company; taking Lee Iacocca bowling at midnight; seeing your weekend with “another woman” advertised on a billboard. The stories in Funny Business really happened. 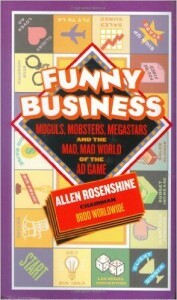 They come from Allen Rosenshine’s more than forty years at BBDO, one of the world’s foremost advertising agencies. And what a supporting cast – Jack Welch, George H. W. Bush, Michael Jackson, Joe DiMaggio, Marlon Brando, Frank Sinatra, Rudy Giuliani, Joe Louis, Henry Kissinger, Bob Newhart, Catfish Hunter, Thurman Munson, Yogi Berra, Whitey Ford, Don King, Luciano Pavarotti, Tommy Lasorda, Lionel Richie, Duke Snider, William Wrigley, Lou Dobbs, and many other movers and shakers – a host of famous names (and a few aliases) in less than famous but truly funy scenarios. The moguls – many of America’s most recognizable captains of industry – appear in scenes not customary in any corporate boardroom. The mobsters are characters far more funny than threatening. The megastars – from presidents to pop artists to pro athletes – are captured here as no camera has ever seen them. When those crowds mix with the madcap world of Avenue, it is never business as usual. And there’s the author himself, owning up to his own follies, foibles and foul-ups – a comic counterpoint to his being recognized as one of the most prominent people in advertising. Funny Business is not just about business. It’s about all of us – the only creatures on earth who can laugh at ourselves.